Four-year-old Reagan Urban and her mom, Amy Urban, 33, a Lone Star College-North Harris nursing student, enjoy a rare dry blue sky day in usually hot humid Houston. 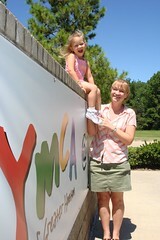 Reagan was the first child to be enrolled in the Child Watch program provided by YMCA Child Development Center at Lone Star College-North Harris. The unique and affordable day care program, one of three provided by the center, allows drop-in care-for children ages 18 months to four years-of students attending classes at the LSC-North Harris campus. Students can match their day care needs with their class schedule. Dr. Steve Head, president of LSC-North Harris, is passionate about removing barriers that might prevent students from completing their higher education goals. Offering the new child care program has allowed more than 41 students to ease their stress of balancing school and family. For more information, call 281.765.7730. Lone Star College System consists of five colleges, including CyFair, Kingwood, Montgomery, North Harris, and Tomball, six centers and Lone Star College-University Center. It is the largest college system in the Houston area, and third largest community college district in Texas. To learn more, visit LoneStar.edu.